Healthcare is a dynamic and fastest growing field in US. Health care industry mainly focuses on exploring techniques to enhance the quality and efficiency of medical services offered at minimized costs. Healthcare administration consistently implements various business management strategies to boost up their profits at low investment costs; while improving the standards of services offered. It also manages various administrative aspects including personnel, management, finance, resource management and many more. Top online healthcare Administration and management degree programs are highly flexible, leading to ample career options in healthcare administration management field. Accredited healthcare colleges, universities and schools offer various degree options; including associates, bachelor's, masters and doctorate programs along with diploma, undergraduate and postgraduate certificates in healthcare administration programs. Healthcare Management and Healthcare Administration are the synonyms for each other. They are the liveliest, flourishing and growth oriented career options nowadays. Healthcare professionals may not deal directly with the patients; but are responsible for maintaining track records of each and every patient for the services offered and its cost implications. Healthcare executives are mainly responsible for team management, maintaining patient records and the confidentiality, financial aspects against the services offered, delivering actual – accurate - appropriate treatment to patients. Bachelor's degree holders in healthcare administration may seek RHIA (Registered Health Information Administrator) certification from AHIMA (American Health Information Management Association) for advanced career opportunities. CAHME (Commission on Accreditation of Healthcare Management Education) provides academic programs for students who wish to further their education in healthcare administration/management field; significantly improving the career prospects. U.S. Bureau of labor statistics report states that the median annual salary for healthcare administrators in May 2010 was $84,270. MHSA (Master of Health Services Administration) and MBA (Master of Business administration); degree holders in healthcare management and administration field are likely to get paid well, compared to others. Team management is the prime responsibility in order to deliver flawless services. Nursing Home Administrators also take care of patients admitted in their facility and handle various aspects related to finances – records – confidentiality of the services offered. Clinical Managers are responsible for particular departments such as surgery, physical therapy, nursing and many more, basis their area of expertise. They also manage the overall department with duties including designing policies and procedures, preparing forecasted budgets, performance reviews and appraisals for the staff members and so on. Health Information Managers are mainly responsible to maintain patient's records in accurate – genuine and confidential manner. 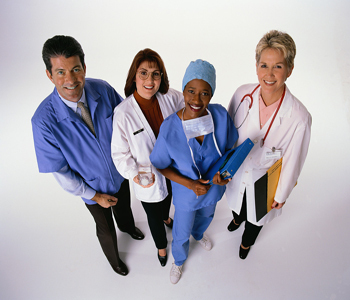 They ensure that only authorized personnel' have access to patient's health records. Associate Administrator is responsible for the Planning and managing the routine work flow for various units including nursing, therapy and many more. Healthcare Executives prepare, analyze and supervise to ensure; appropriate care/treatment is being provided to the patient on the basis of patient's health records and information. Though they do not interact directly to the patients; they act as mediators and also work hand in hand with the ground level staff and head of departments for betterment of the services provided to the patients. American College of Healthcare Executives and Medical Group Management Association has depicted a list of wide array of career prospects in health care industry. Degree in Healthcare Administration qualifies you for a wide range of healthcare administration careers; which may provide long-term satisfaction in terms of a profession and may lead you to a rewarding career. Duration: 3-5 years post Master's or Bachelor's in Healthcare Administration. Offered by: Colleges and Universities. Eligibility: Bachelors in Health Administration. Ideal for: Attaining Higher Designations including Clinical Director, Hospital Administrator, Social Service Managers, Mental Health Managers, Part-time or full time faculty in medical colleges and many more. Offered by: colleges, schools and universities. Eligibility: Bachelor's degree in Healthcare Administration. Ideal for: Attaining positions including Healthcare Marketing Director, Health Policy Analysts, Healthcare Educators and many more. Ideal for: Entry-level positions including care and service co-coordinators, practice administrators, healthcare administrators, administrative medical assistant and many more. Ideal for: Individuals interested to take a first step in countless job openings in healthcare industry. BLS estimates a 22% increase in Healthcare Administration jobs. Graduate or Under-Graduate Degree in Healthcare Administration provides essential and adequate education, training and practical knowledge leading to abundant career paths in healthcare industry.